So, the very minute I saw this post I knew I had to make these. The only bummer was that I didn’t already have some prepared vanilla salt. Who am I?!?! I have homemade vanilla sugar and homemade vanilla extract. And locally made vanilla paste that I buy from The Spice Station (greatest place on Earth). I made these cookies sans proper vanilla salt. I did mix some sea salt together with some vanilla powder though….because my salt needed to be vanilla-y. Needless to say, I found a reason to use a few vanilla beans, these cookies being one, and now have some vanilla salt infusing in the cupboard. I did make some pretty important (and some not important) but easy edits and substitutions to this recipe. Warning: making this recipe will likely result in over-consumption of cookies. Have some friends over or you will regret them. 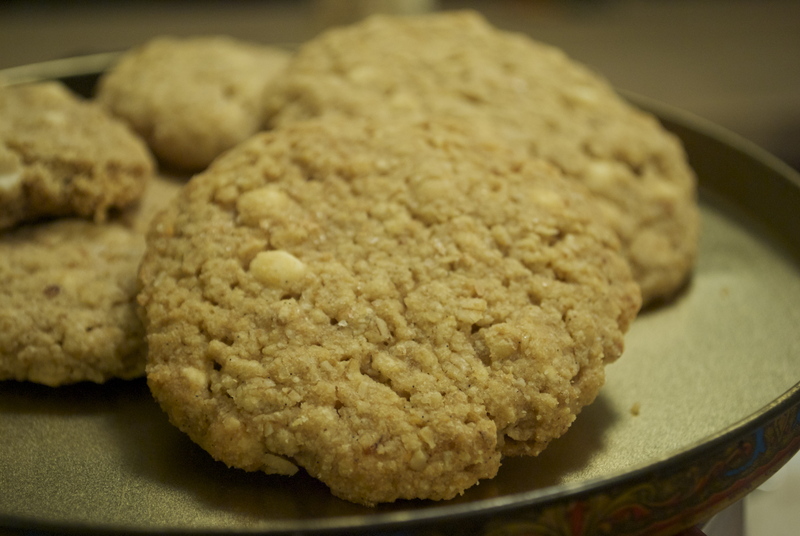 They taste like the perfect sugar cookie mixed with the perfect oatmeal cookie. 1. White chocolate: Sometimes this can be a tricky substitution for vegans. For this recipe, I recommend you do not roast your vegan white chocolate. 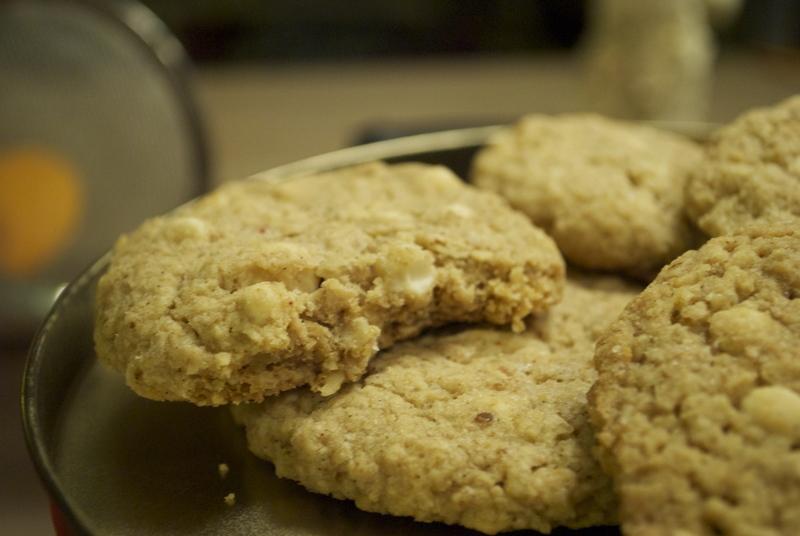 You can use chunks cut up from homemade white chocolate or use white chocolate chips, but don’t heat them. Add them into your stand mixer at the end, when you would normally add regular chocolate chips. 2. Sub out the butter for equal amounts Earth Balance, do not omit any salt. 3. I did not have the cereal called for and I could not find it anywhere. As Irvin suggests, I used rolled oats instead and they worked great. 4. I used 2 tsp dry Ener-G egg replacer to replace two eggs. Do not mix with water. 6. I had no vanilla salt on hand, so I mixed some coarse sea salt with vanilla powder. You may also try mixing some coarse salt with some seeds scraped from a vanilla bean. Use the hull to infuse some salt for next time. ← Birthday Cake for my Bro + So Much to Love. They look lovely, I love the idea of salted caramel and vanilla. Love your blog banner, too! Those really do look perfect. I looove the salty and sweet combo in cookies. You’re making me feel like I’m lacking in the vanilla department, all I own is extract.